SOUTHFIELD, Michigan -- Delphi Automotive Plc said its initial public offering was priced at $22-$24 a share, valuing the former auto parts unit of General Motors Co. at about $7.55 billion. The offering, which comes less than two years after the company emerged from bankruptcy, would raise about $554.3 million at the midpoint of the proposed price range, Delphi Automotive said in a regulatory filing on Monday. The amount the company is planning to raise is much less than the $1 billion it was originally aiming for, a person familiar with the situation told Reuters last week. Delphi Automotive, which said the offering would consist of about 24.1 million shares, plans to list its shares on the New York Stock Exchange. The IPO is being underwritten by 18 underwriters led by Goldman Sachs and J.P. Morgan. RBC Capital Markets no longer forms part of the group of underwriters, according to the filing. The company is itself not selling any shares in the IPO. The offering comprises shares from certain stockholders, including from hedge fund Paulson & Co, which is selling 20.6 million shares. 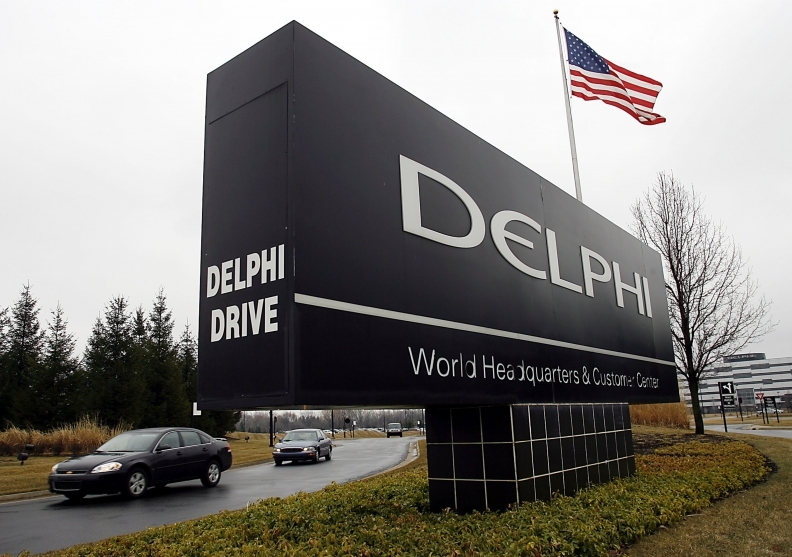 Delphi filed for bankruptcy in 2005 after succumbing to high costs for wages and legacy benefits inherited in its spinoff from U.S. automaker General Motors in 1999. It emerged from bankruptcy four years later, with GM and hedge funds Silver Point Capital LP and Elliott Management taking a controlling stake in the company. Earlier this year, Delphi bought back stakes held by GM and Pension Benefit Guaranty Corp for about $4.4 billion in a bid to simplify its capital structure. The amount of money a company says it plans to raise in its first IPO filing is used to calculate registration fees. The final size of the IPO can be different. Delphi plans to begin marketing to investors this week, two people familiar with the sale said earlier. The shares will probably begin trading Nov. 17, one of the people said. Delphi is moving ahead with its IPO amid the turbulence in global markets and the automobile industry that caused billionaire Wilbur Ross in September to delay the offering of his International Automotive Components Group until at least January. IPOs totaling $8.9 billion were canceled or postponed in the third quarter.